Turn the dial fully downward. The indicator turns off. 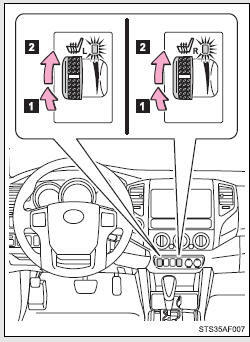 ●Do not cover the seat with anything when using the seat heater. ●Do not use the seat heater more than necessary. Doing so may cause minor burns or overheating. Do not put heavy objects that have an uneven surface on the seat and do not stick sharp objects (needles, nails, etc.) into the seat. Turn the seat heaters off when the engine is not running.